KVS admit card 2014 - KVS LDC admit card - The admit card of KVS LDC exam are available for download from 22 November 2014 at the direct link given below. Candidate can also download admit card for all written tests from that link. Kendriya Vidyalaya Sangathan is a system of central government schools in India comprising of more than 1000+ schools and large no. of staff. For these schools KVS conducts written examination for various posts including Clerk, Assistant, Principal, Steno, translator etc. posts. Large number of candidates have apply for these posts. Recently it had already conducted written test for Upper Division Clerk, Stenographer, Assistants, finance officer etc. The written test for LDC posts will be held in 13 December 2014 (2:30 pm to 4:30 pm) for which admit card had been released. Those candidates who had applied, can now download their KVS exam admit card from the direct link below. KVS LDC Admit card 2014 - released on 22 November 2014. Those candidates who had applied, can download their KVS admit card 2014 for written examination from above direct link. Kendriya Vidyalaya Sangathan is an organization founded in 1963 having more than 1000 schools, 1100000+ students and 56000+ employees all over the nation. Its is to educate children of the Central Govt. employees. Huge number of candidates apply for its examination for any post. KVS conducts several examinations every year for different vacancies. 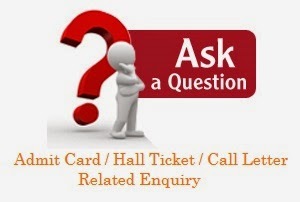 KVS admit card / hall ticket can be downloaded from above. To download, candidates need to follow the procedure given here. 2. Then on that page, they need to select the post from the drop down menu and click on next. Their KVS written test admit card 2014 will be displayed by the website. Candidates should take a print of the admit card and brint it at the time of examination. All details like roll number, vanue, date etc. are mentioned in them.